This wonderful post-dinner mukhwas contains various seeds rich in omega-3 fatty acids. Omega-3 fatty acids help to increase the good cholesterol (HDL), improve immunity, and also contributes to beautiful glowing skin. 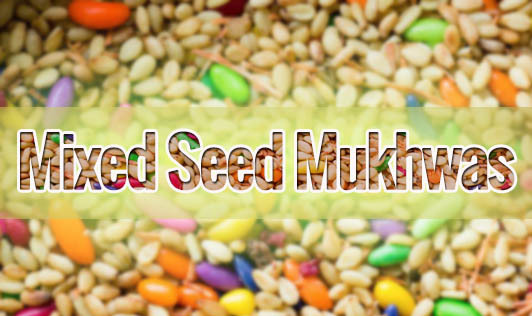 Mukhwas is an easy way of consuming these seeds. Do give a try to this tongue-teasing mix of mukhwas. • Mix all the seeds in a bowl, add lemon juice and salt, and mix. Keep aside for an hour. • Heat a nonstick tawa on medium flame; add the mixture and dry roast for about 2 to 3 minutes until it starts giving out a good aroma (or) you can also microwave it for 30 seconds on high power. • Turn off the stove and cool slightly. • Now add the powdered sugar and mix well. • Cool it well and store in an air-tight container. Note: Make sure you don't over roast the seeds as it can lead to the loss of omega-3 fatty acids.